Jeffrey Brown has his fingers in all the pies and he’s extremely talented to boot. 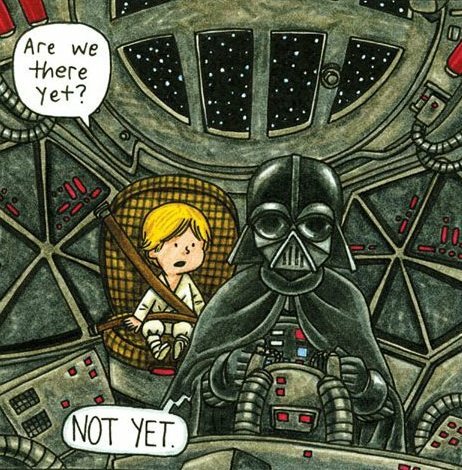 One of his books which really caught our attention was his series called “Darth Vader and Son” which tackles the everyday conversations and happenings between father and son, but Darth Vader style. 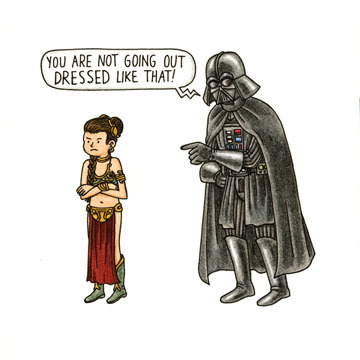 What surprised us even more was his new series “Vader’s Little Princess” which looks just as promising and entertaining as the previous series. We can’t wait to get our hands on both books! Without further ado, we give you our honorable mention interview with the legendary and talented Jeffrey Brown. 1. Do you remember the first picture you ever drew (or made money from)? 2. Your three biggest career highlights so far and why? 3. Is there anything you find particularly challenging to draw? 4. How do you kick start your creativity every day? 6. If you were in a drawing contest, who would be your ultimate opponent? 7. Are you a geek? If so, how geeky are we talking? 8. 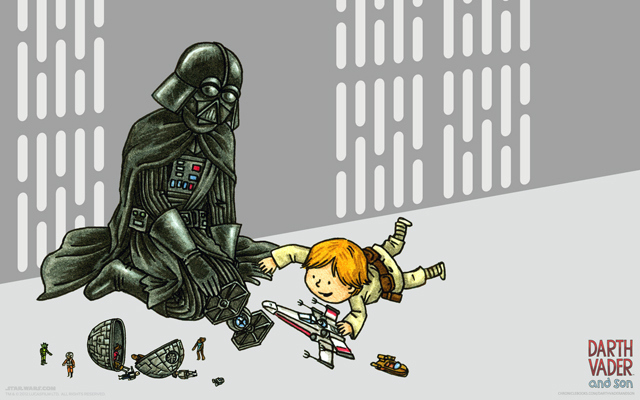 How did you come up with all the situations in Darth Vader and Son? 9. What’s your favorite image from that series? 10. 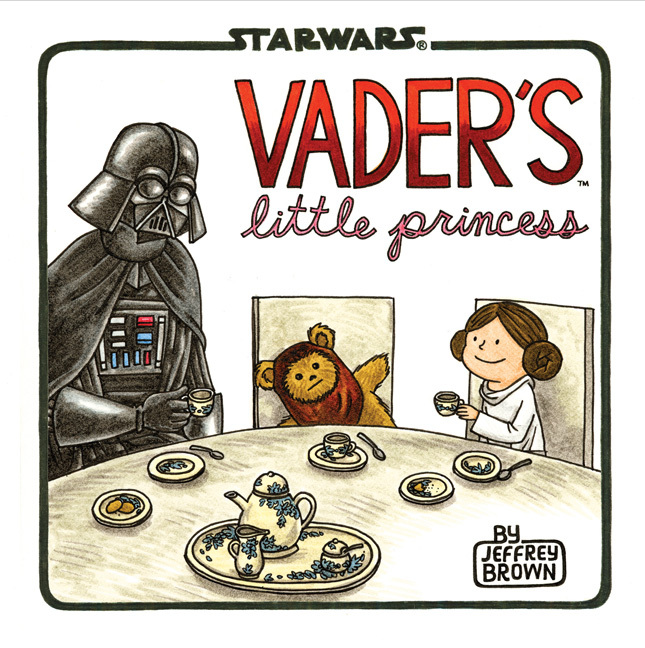 The sequel, Vader’s Little Princess, is also coming to stores soon. Tell us more! 11. Any tips for up and coming illustrators out there? My mom saves everything, and so I have some of my first drawings – there’s one of a fish breathing fire that I drew when I was three. For money, I entered a contest at a local art supply store to design a Christmas card. I drew Santa stuck in a chimney and won ten dollars of art supplies. The first highlight is my first book Clumsy, which I initially self-published. I’m still really proud of the book, and it’s one people still respond a lot to. The second highlight is Darth Vader and son, which was not only a dream come true to draw Star Wars, but the response has been overwhelming also. Finally, I think this whole year of 2013 will be one big highlight for me – I’ll be releasing Vader’s little princess, as well as my next autobiographical book A Matter Of Life, another Star Wars book for middle grade readers called Jedi Academy, and Save The Date, the movie I co-wrote and created artwork for, will come out on DVD. I always struggle with cars, because I pretty much have no interest in cars. I’d be about the worst person if someone was needed to identify a car that just drove by. I always try to have lots of different projects going on, preferably half-finished, so when I wake up I’m already itching to get back to work on something. I like to listen to music if I’m working on the writing side, or watch video if I’m drawing something. I usually wake up around 6:30am and get dressed, then help get my wife and son ready for work and school while checking email. As soon as they’re off to work and school, I’ll either work at home or head to the local coffee shop to get things done, and come home for lunch. Get some more work done before picking up my son from school, and either play with him or get some more work done before making dinner. After dinner it’s the bedtime routine, and my wife usually goes to bed earlier and I’ll stay up until midnight or so getting some more drawing done. I don’t know if he’d really be my ultimate opponent, but I think I’d have a contest with my friend James Kochalka, because we’d both have a lot of fun. I am, but I don’t know how much of one I’m considered. I can be a bit of a luddite at times, and I play soccer and watch hockey. At the same time I’ve got a huge collection of Star Wars cards and stuff and I read all the Warhammer 40,000 books (and used to play the game). So I’m probably a geek compared to the mainstream, but not by true geek standards. Much of it was just based on situations between my son and I, but I also sat down and watched all the Star Wars films repeatedly while taking notes and thinking about potential parenting jokes I could make. There’s a scene in Vader’s little princess with IG-88 that I keep coming back to. IG-88 is a lot of fun to draw. Even before Darth Vader and son was finished we were talking about a sequel and the obvious need to give Princess Leia some attention. A lot of the young child-parenting situations had been covered in the first book, so for this book it made sense to show Leia becoming the rebellious teenager, and show some different sides to things, as well as making jokes about Han Solo being her boyfriend. I think there’s four aspects, that apply to any artistic or creative field, that anyone interested in getting into should do. The first is research – you should look at everything related you can, study the work that others have made before you. The second is meeting – meet other people in the field and talk to them, ask their advice and learn their stories; there’s no substitute for first person interactions. The third thing is feedback – send your work out to other makers and publishers, and listen to what they have to say about your work. Obviously, school is a great place for this. Fourth and finally, and most importantly, is to make. Make work, make a lot of it. You’ll learn as much or more from just making the work, and it’s the only way you’ll get better, as well as the best way to get noticed. Thank you Jeffrey for your time and keep on inspiring, we wish you all of the best in your career!